Who can resist tasty cheese with a splash of mayonnaise? 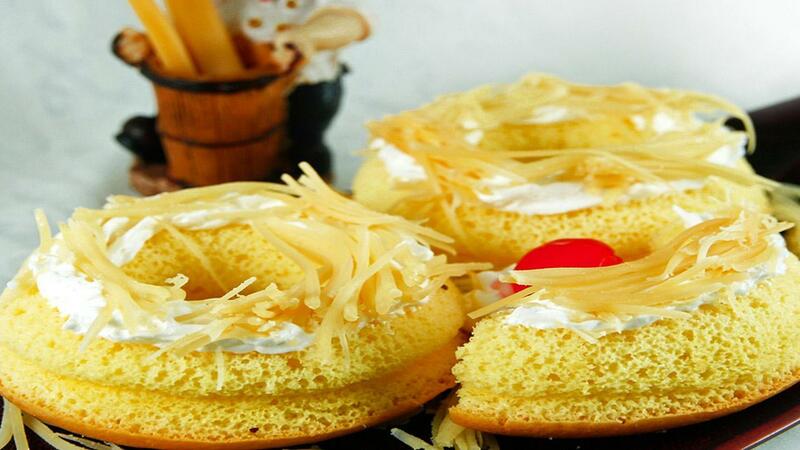 This pastry looks like a donut with a savoury flavour and will tempt your customers. Whisk egg whites until smooth and add sugar gradually. Heat margarine, Toffieco cheese pasta, cheese cream, and whole milk on a double boiler, and then mix it with egg yolk, egg white, wheat flour, maizena flour and stir them evenly. Mix this with mixture number 1 and stir them evenly. Mould the dough on a donut-shaped mould, steam-bake them in a 180° C oven. Once they are cooked garnish the top with Best Foods Mayo Magic and mozzarella cheese. Toast on top grill for about 5 minutes until the cheese melts or you can smear it using Best Foods Mayo Magic instead and then sprinkle cheddar cheese.